While cats are dedicated self-groomers, this doesn’t mean that you should rule out giving them a bath with shampoo. Perhaps they have rubbed themselves against something which is dangerous to lick off themselves or they have some health conditions which makes cleaning movements more difficult. Or they may simply be older and have reduced endurance and mobility. So, whether this is the first time you have ever bought cat shampoo, or you are simply looking for a little more information about the products on the market, you have come to the right place. In this blog post, we will delve deeper into the various options you have available to help you make a more informed decision. Made from all-natural ingredients, this shampoo is suitable for cats and other small animals. There are no harsh chemicals and the PH has been balanced to make is suitable for felines with sensitive skin. Since it is soap-less and detergent free, it will not irritate the eyes of your cat while you are trying to give them a bath. Pro Pet Works is a company with very strong environmental beliefs, which is why all of their products are 100% biodegradable and made using recycled materials. The combination of Aloe Vera and almond oil are included to soothe your pet’s skin and leave them smelling clean and fresh. Made using oatmeal and aloe vera, this pet shampoo is designed to fight against skin irritation, as well as promoting healing and remoisturizing dry and flaky skin. The formula is both soap-free and pH-balanced, allowing it to clean your cat’s coat and leaving with a fresh smell with a vanilla scent. When using it, you can rest assured that it is not going to wash off any flea applications which you have used on your cat. Also, it has the benefit of treating tangled fur, which will make your cat’s next grooming session so much easier! We all know that most cats don’t like water, and this cat shampoo offers a practical solution to this issue. It is waterless and there is no need to rinse the foam from your feline. At the same time, it still soothes and moisturizes your cat’s dry skin. Some of the cleaning and conditioning substances include aloe vera, neem oil, vitamin E, and oatmeal. It is safe to use on young kittens of 12 weeks or older, as well as adult felines. Both you and your cat will love the fresh smell it leaves them with! If you have a long-haired cat who always seems to get tangled and matted, this shampoo will aid in the smoothing out of their fur. Once your cat has been washed in this substance, they will walk away smelling and feeling clean. Suitable for kittens as young as six weeks old and adult cats too, the shampoo has been specially formulated to match the pH balance of your pet’s skin. Several different sizes are available depending on how many pets you have in your household and how often they need a bath. If your cat is scratching all the time due to dry skin, you will be looking for a way that you can offer them some relief. Free of the kind of harsh chemicals which can be highly irritating to your cat’s skin, a combination of Aloe Vera, coconut oil, colloidal oatmeal and ordenone rejuvenates and freshens the coat. Since it is made in the USA to high standards, you can rest assured that it has been tested extensively, and plenty of other pet owners testify to the positive effects. Just rinse it through your pet’s coat and the specially-blended formula will get to work. As well as relieving your pet’s dry and itchy skin, this oatmeal shampoo also helps to restore their natural oils and promotes healthy skin. Not only this, but it also improves the texture of their coat, so your fluff ball will be even softer to the touch! Gentle, non-toxic, and safe, it is suitable for cats both young and old. If your cat is suffering from skin conditions or infections, this shampoo promises to soothe their suffering. On top of all this, it will leave them smelling their very best! A 2-in-1 shampoo and conditioner, the blend of natural ingredients is designed to clean, protect, and enhance your cat’s skin and coat. Since it is organic and mild, it is designed to calm your cat’s itchy skin, but it also has a deodorizing and moisturizing effect which cats appreciate. The formula is specially designed to not have any kind of burning effect when it comes into contact with your cat’s eyes. Ultimately, it makes bath time a much more pleasurable experience for your feline friend, as well as helping them to stay in good health. Almost entirely made of natural ingredients, this kitty shampoo is mild and contains a range of natural ingredients including buttermilk powder, honey, and beeswax. Once you have given your little ball of fur a bath, they will come out feeling and smelling fresh. 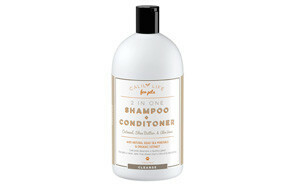 Made in the USA, the shampoo is designed to have a gentle, cleansing effect. The grooming products have been specially formulated to match your pet’s pH balance. Perfect for cats with all types of coat, the gentle formula has been specially designed to not irritate your pet’s eyes or flare up their sensitive skin. As for the coat, protein and lanolin help to bring it back to looking its very best. Using a simple color-coded system, you can easily select the right product based on your pet’s individual needs. The 12-oz bottle size ensures that you will be able to give your cat plenty of baths before it runs out. Made using a special formula of organic oatmeal, baking soda, & aloe vera, this pet shampoo offers relief from itchy skin and hotspots. As well as removing odor, it also leaves behind an oatmeal cookie scent, which is bound to be a hit in your household! Since the soap lotion is hypoallergenic, anti-bacterial & anti-fungal, it helps to prevent allergies and does not irritate the skin with harmful chemicals. The ingredients are plant-derived which ensure that they are not going to irritate your pet’s eyes. There are plenty of different considerations that are worth making before you settle on the right cat shampoo for your furry friend. Here are just a few of the top points which you should bear in mind. It is always worth checking the back of the bottle before settling on the shampoo which is best. Since cats groom themselves all the time, they are likely to end up ingesting whatever is on their skin and coat, and you need to know more about what is going into their body. Bear in mind that words such as ‘organic’ and ‘natural’ don’t necessarily mean that they are good for your feline. Train yourself to look beyond the marketing language and you will have a better idea of what is going on. 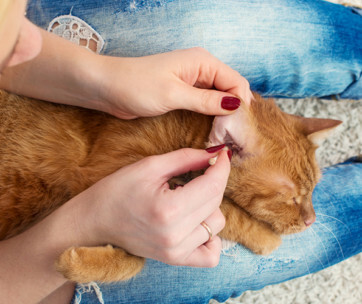 If your cat is suffering from a pest condition such as fleas, you may need to use a shampoo which contains chemicals, but it is worth consulting with your vet beforehand for confirmation. Following on from the point above, cats have especially sensitive skin which harsh chemicals can end up damaging and irritating. To find out what they include, you will need to do your research. If you are ever unsure about putting something on your cat’s body, it is always worth consulting your vet. Heavy fragrance should be avoided as much as possible. While some cats don’t mind this, others find that it has an irritating effect. A few examples of other chemicals to avoid include parabens, artificial dyes, sodium laurel sulfate, pyrethroids, and petrochemicals. While many cat shampoos are for general usage on all felines, others are designed for specific cats. For example, there are special shampoos for kittens or senior cats. Also, there are those which are made for felines with sensitive skin or those with particularly long coats. If you have a cat who has an aversion to going anywhere near water, a dry shampoo may be the best option. So, these specialized cat shampoos are certainly worth comparing with their more generic counterparts. You can also look into getting a shampoo for your cat which is made for their specific health condition. For example, some will reduce the risk of hairballs, while others fight against skin conditions like dandruff. Also, some will help to deal with ticks and fleas which have made their home on your cat. If your cat is suffering from a specific health condition, it is worth speaking to your veterinarian for more information on the best way to deal with it. If you have ever tried to bathe your cat before, you will probably already be only too aware that most felines don’t enjoy it! The question of whether cats need baths is one which is hotly debated. Obviously, cats are self-grooming animals, and this leads some people to conclude that bathing them is not worthwhile. However, giving your feline friend a bath can have some positive benefits on their skin and coat. There are some situations when giving your bath is advisable. If they get covered in dirt or any kind of substance which they shouldn’t ingest, this will stop them from licking up during their regular grooming session. Similarly, if they get something stuck around their paws or bottom area, it is a good time for a bath. Alternatively, your cat may have matted hair or some other kind of fur problem which needs to be cleared up. Bathing can also help to fight back against shedding hair which can lead to hairballs. When some cats get older, they become less fastidious in their grooming, so you may have to give them a bath yourself. Alternatively, they may be suffering from some sort of physical impediment which makes bending difficult or they may be simply overweight. Of course, there are also various skin and coat conditions which may make it necessary to wash your cat with a special medicated shampoo. This is something that you should discuss with your vet if it is the case. There are a number of benefits which bathing your cat on a regular basis will provide. First of all, you have the obvious cleaning effects on your feline’s coat and skin. Also, it helps to remove loose hair from your cat’s coat. Not only will this stop the fur from getting all over your house and clothes, but it will also decrease the number of hairballs that your cat will get from grooming themselves. If you have allergy sufferers in the house, they are more likely to be able to tolerate a clean cat compared to a dirty and hairy feline. When you are bathing your cat, this gives you the opportunity to give them an inspection and discover any injuries or health problems that they may be suffering from including ticks, fleas, rashes, or other infections. Discover these issues early and you will be able to report them to your vet and take action against them at the soonest possible opportunity You will also have the opportunity to remove mats from their fur, which can prove to be uncomfortable for your cat. Finally, you have the simple pleasure of your cat looking and smelling at their very best! There are several different types of cat shampoo which are all worth considering in more detail before you settle on the right one for your furry friend. 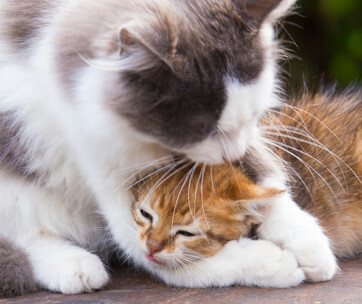 The most standard type of cat shampoo is usually made with a host of natural ingredients which are designed to not irritating your feline’s skin. Generally, they have moisturizing properties which will help to alleviate dry skin. They often promise to leave your cat smelling great with a range of scents. This type of cat shampoo contains conditioner as well as shampoo. As well as soothing and cleaning, it also offers a conditioning and detangling effect. This type of shampoo usually contains the same kind of natural, pH-balanced ingredients, and is especially useful for cats with longer coats. You can also choose to buy shampoo which has been specially formulated for kittens. These shampoos have been designed to be especially gentle for use on your young cats and are also suitable for pregnant felines. Getting your cat into a bath time routine from a young age will help to make the job of washing them so much easier in the future. Just as you can buy dandruff shampoo for humans, the same goes for cats as well. It is specially designed to reduce excess dander, as well as preventing dry, flaky skin, but still has the same cleaning and deodorizing effects of other cat shampoos. Homes with cat allergies will particularly benefit from this type of product. Finally, we have the type of cat shampoo which doesn’t require water to work. If your cat resists water with every fiber of their being, this may well prove to be the best choice. All you have to do is apply the product and massage it into your cat’s skin. You should then let your cat air-dry, before brushing to remove accumulated dirt and debris. Q: How Do I Properly Bathe my Cat? A: As we have already mentioned earlier on, bathing your cat is an activity which many felines do not enjoy, so you are going to need a lot of patience, as well as taking the right approach. If you have a second person to comfort your cat while you are bathing them, this will help to make your job a whole lot easier. Get everything you need in one place to ensure that there are no disruptions. If your cat gets away, they are likely to be very hard to catch again! As well as your chosen shampoo, you will also need some rubber gloves, a small cloth for their face and some cotton balls for their ears. A gentle spray bottle will help with rinsing, while a large towel will ensure that they get warm and dry quickly after the bath. Most of the time, bathing your cat’s body will be enough. Many felines get scared when water goes anywhere near their face, and you should certainly avoid submerging their head entirely. Bear in mind that even the calmest of cats can end up scratching and biting if you are not careful. Many people choose to bathe their cat in a sink rather than a bathtub. Fill it with some lukewarm water and wet your cat’s body from their shoulders to their tail. Grab the shampoo and start lathering and massaging it into your cat’s coat. After you have covered as much as you can, rinse it off as thoroughly as possible. To clean their head, you can use a dampened washcloth, while a cotton ball can be used for their ears. Avoid putting anything directly into the ears themselves. Once you have finished washing them, you can now put your cat onto the towel and fold it around them. Dry as much of their body as you can – or as much as they will allow you at this stage! If your cat has long hair, you can try using a blow-dryer on them, but if it proves to be too scary, you should avoid this drying method. If you have a cat who is impossible to bathe in water, you could always look into dry shampoos. Choose an area where you would like to bathe them. An enclosed area like a bathroom works well. Start by brushing your pet thoroughly using a stiff brush to remove loose hair and debris that has got trapped in their fur. Start by shaking a small amount onto your pet’s fur to ensure they don’t have a negative reaction. 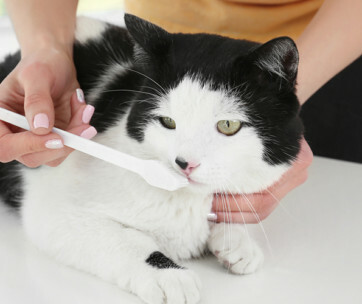 You can either use a soft brush or your fingers to massage the formula into your cat’s fur. Continue until their body has been properly covered. The shampoo needs to set for around 20 minutes – or as long as 50 minutes if your pet’s fur is particularly dirty. Once the job is done, you can brush your pet thoroughly to remove the formula. Q: Can I Use Human Shampoo on my Cat? A: You should never use human shampoo on your feline. 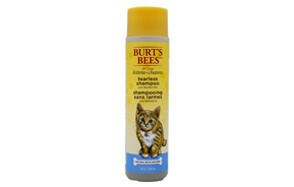 Cat shampoo has been specially formulated for your cat’s sensitive skin, and usually contains all-natural ingredients. Even the mildest of human shampoo and conditioners are likely to have a negative effect on your cat. Not only is it likely to dry it out, but it is also likely to cause irritation as well. Choose a product from the list above instead and you can give your cat a bath which is going to have a positive impact on their fur and skin rather than risking causing unnecessary damage to it. Q: Can I Use Dish Soap on my Cat? A: In certain situations, dish soap can be used on your cat. However, it is not something which you should use on a regular basis. Dish soap is useful in removing fleas, skunk spray, and oil-based substances. But since it has a very drying effect, it is something which should be reserved for emergencies rather than washing on a regular basis. If you are going to use it, you should choose one which is highly gentle to take out fewer essential oils. For regular washing, you should choose a specially formulated cat shampoo. 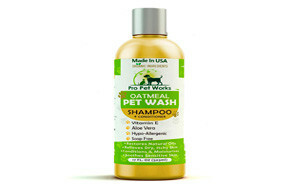 We have chosen this shampoo and conditioner from Pro Pet Works as our number one choice of cat shampoos. Recommended by vets, it contains a host of organic ingredients which are specially made for skin which is particularly dry, sensitive or itchy. Soap-less and detergent free, it is designed not to cause any irritation. 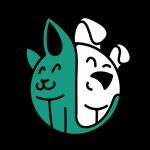 Some of the main ingredients include organic aloe extracts, almond oil and vitamins A, D & E. For us, it ticks all the boxes and does everything that you would want from a high-quality cat shampoo.